Badis juergenschmidti Schindler & Linke, 2010 - Perciformes > Badidae . Asia: known only from the type locality, Ka Dat Chaung River in south eastern central Myanmar. Badis juergenschmidti is a new species of Indo-Burmese freshwater fish from the family Badidae which was recently described from specimens collected in Myanmar. Badis juergenschmidti differs from similar Badis species by it’s distinct lack of an opercular spot, and the bright white margins of it’s unpaired fins. The largest specimen, the Holotype of Badis juergenschmidti , measures in a just under 35mm, or about 1.5 inches long. This may seem small but it is still much larger than other more diminutive Badis species which rarely reach over an inch long. A male Badis juergenschmidti is pictured above without any bars, but males appear to display this barring pattern at will. 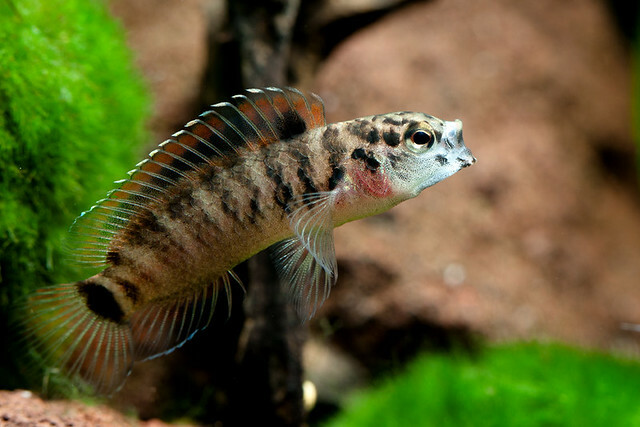 Badis juergenschmidti has already been spawned in captivity and it has been discovered to be a cave-spawning species with young being under parental care for about 7 days. Badis juergenschmidti was described by Ingo Schindler and Horst Linke in the latest issue of Vertebrate Zoology - name in honorr of Jürgen Schmidt. More and larger images of Badis juergenschmidti can be seen on the Mesonauta website. > Badis juergenschmidti – a new species of the Indo-Burmese fish family Badidae (Teleostei: Perciformes) from Myanmar. INGO SCHINDLER & HORST LINKE . Vertebrate Zoology 60 (3) 2010 (209 – 216). Badis juergenschmidti sp. n. is described from south central Myanmar. The new species is easily distinguished from its congeners by the lack of conspicuous spots on posterodorsal corner of opercle and superficial part of cleithrum, caudal fin with contrasted white margin posterodorsally and posteroventrally in adult males. A new numbering standard for the vertical bar pattern is provided. Notes on habitat and reproductive behaviour of the herein described species are given. The genus Badis Bleeker, 1854 was revised in 2002 by Kullander & Britz; they described and redescribed 12 valid Badis species. The recently published descriptions of B. tuivaiei Vishwanath & Shanta, 2004 and B. dibruensis Geetakumari & Vishwanath, 2010, both from India, lift the number of speciesto 14. The members of the genus are distributed from middle Mekong in the east to the Indus drainage in the west (Kullander & Britz, 2002). The centre of the species diversity of the genus lies in north-eastern India, Bangladesh and Myanmar. During a field trip in Myanmar the second author was able to collect specimens of an unknown species of Badis near the famous Kyaiktiyo Pagoda which is also well known as the ‘Golden Rock’. Comparison with the other species of the genus from in- and outside Myanmar showed that the newly collected material represents a new species. The purpose of this paper is to provide a formal description of this badid as B. juergenschmidti. Geographical distribution. So far only known from the type locality, the Ka Dat Chaung River, south eastern central Myanmar. Ecological notes. The type locality is a small river with a width of about fifty meters during the rainy season. At the time of collecting, in March, it was the dry season and the water was very shallow (about 20 to 30 cm). The current was slow. The river bed was characterized by boulders, pebbles and sand. Some parts are covered by a thin biofilm or detritus. The wa ter was clear. Its temperature (at 9.30 in the morning) was 26.9 °C and the water was very soft (electric conductivity 6 μS). The pH-value measured was 6.4 pH. The only other species collected at that location was Acanthocobitis zonalternans; a very common loach in Myanmar. Reproductive behaviour. Observations in captivity showed that Badis juergenschmidti is a cave brooder. After spawning the male takes care of the brood by himself. It does not allow the females to enter the caveafterwards. During the brood care it leaves the cave to eat something and to chase away intruders. After around 7 days the offspring leave the cave. Etymology. The species epithet honours Dr. Jürgen Schmidt (Ruhmannsfelden, Germany) for his valuable contributions on the ethology and taxonomy of Southeast-Asian freshwater fishes.